The best way to get to know a community is by scheduling a tour. See the facilities, meet the staff and residents, and get a feel first hand what it's like to live at Allisonville Meadows Assisted Living Assisted Living. For families in Fishers, Indiana, they can turn to Allisonville Meadows Assisted Living to provide the supportive services and family-like setting that their loved one desires. Our communities are staffed with trained caregivers and healthcare professionals who believe in our philosophy of C.A.R.E. (Compassion, Attentiveness, Relationships and Excellence). And it is this philosophy which will contribute to enhancing the well-being of our residents. Allisonville Meadows Assisted Living is one of the many retirement communities owned by American Senior Communities. We created our company to address the challenge of fragmentation of home and health services, and all our communities are designed to serve seniors though an offering of lifestyle choices and integrated amenities and services. Whether you are seeking an apartment or a garden home, we have the lifestyle options to meet your needs. Our apartments feature full kitchens, walk-in closets and an open floor plan. Residents can decorate the apartment with their beloved treasures to make it feel like home. There is also a state-of-the-art response system which provides a sense of security while encouraging independence. 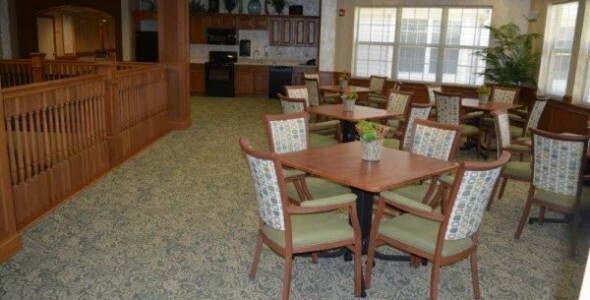 The community amenities at Allisonville Meadows Assisted Living are many. Residents may be found gathering for movie night in the TV lounge or dropping by the beauty salon for a haircut. And coupled with our daily activities and outings, our residents never lack for having fun-filled days. When seniors join our community, they are saying good-bye to life's responsibilities. Delicious meals are served three times a day in the community dining room. Housekeeping and linen services are handled by our staff, as is scheduled transportation for running errands or reaching doctor's appointments. And new services are always added to meet our residents' needs. But we don't just provide services which relieve the burden of life's responsibilities; we also provide supportive care that supports and promotes our residents' well-being and independence. Assistance with activities of daily living and medication management are just a few of the services that we offer. The level of support is customized for each resident and can be increased as needed. At Allisonville Meadows Assisted Living it is the caring people who create a community which our residents are proud to call home.